General Motors sold its German unit Opel to PSA Group back in 2017, mostly due to lack of potential synergies within General Motors, as European automotive marked had become so different to other GM regions. Before sale, General Motors had owned Opel for 88 years (since 1929)! For PSA Group it was a good deal, as acquisition of Opel made PSA Group grow from third to second largest Europe based automaker. This was needed for PSA Group to better compete with its main giant rival in Europe - also German car brand Volkswagen. So it comes with not much of a surprise that when introducing its first concept after the ownership change, Opel clearly states that GT X Experimental also shows how new brand values will come to life. We will be mentioning fashionable a few times in this article. First, Opel comes back in the most trendy vehicle form as of today – SUV. On Torque News we recently wrote that almost 36% of the passenger cars sold globally during 1st half of 2018 were SUVs. This segment continues to grow and obviously Opel safely sees this trend to last for quite a while, at least until GT X Experimental starts selling, as currently GT X Experimental is at its concept stage which is still far from reaching the production line. Second, this small SUV is an electric car. Opel promises production model to feature 50kWh battery. In rough comparison, Tesla Model 3 has the same battery capacity and it gives Tesla range of 220 miles. Opel plans to have all of its models electrified by 2024. One of the most recognizable brand marketing pillars behind the GT X Experimental is braveness. Opel decided to radically address the brand image so that customers no longer should be shy of their Opel car choice. Perhaps roots of Opel attempts to reposition brand image could be traced back to 2012 when Opel introduced its small stylish model Adam, but in GT X Experimental statement is very clear. Opel emblem is visibly positioned to be expressed in both front and rear, Opel adds compass axes resembling vertical and horizontal lines to further concentrate viewer’s look to the emblem. The whole concept design is showy and daring, lovely and youthful. Upper and lower areas are expressly separated by yellow lines which are echoed by yellow graphic accents on the rims to give the concept “structure and dynamism”. Opel admits the challenge of putting a fashionable vehicle to the market. Head of Design Mark Adams explains: “The very big difference between fashion industry and automotive industry is time. Due to the high complexity of the automotive business, demanding safety requirements and expected engineering robustness, we have to deliver on our visions several years before we can offer our designs for customers to experience it. In the fashion world this workaround is much quicker, so they can be much closer to emerging trends”. 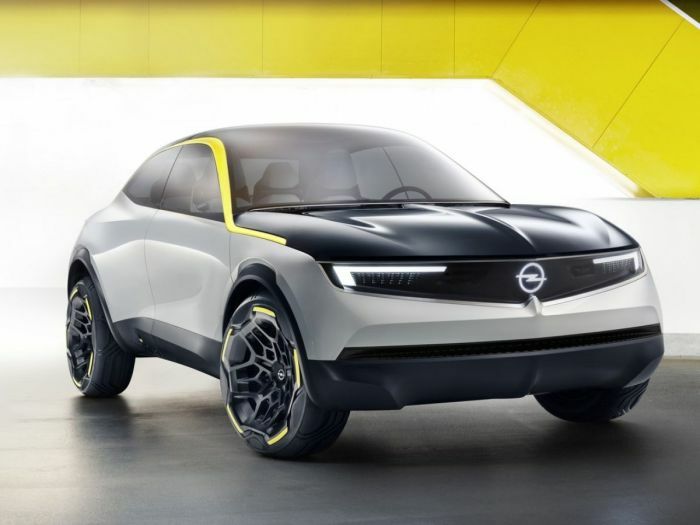 Despite the time factor, some design elements that we see debuting in GT X Experimental concept should make it to other Opel models later in 2020s. Other than the new compass-styled emblem, Opel confirms that Vizor design element is among such. Head of Design Mark Adams introduces the new Opel cars front design element which all Opel models will wear in the future: “The Opel “Vizor” makes its debut on the new GT X Experimental concept and will give our future models a new, distinctive, bold and pure face”. Module includes headlights, daytime running lights, the cameras and sensors of the assistance systems all framed by Opel unique design element. Opel calls this design element Vizor as it is resembles of the eye slot of a motorbike helmet. We have to think much more in the long term and can't afford to #think too much focused on short term because then ideas couldn’t be manifested along the usual lifetime of a vehicle. No doubts Opel GT X Experimental concept looks flashy and trendy to our eyes of today. We wish Opel designers to successfully deal with the time factor and foresee the production design future eyes will want to see, as expectations are now raised. At this point, it’s little more than a “drawing” albeit a nice looking drawing. That’s all that can really be said about it right now.